Unpluggits Playstudio was started as a place where children and parents could have it all – a place to work on arts and crafts, and to play and unwind after. Unpluggits offers over 3,000 square feet devoted solely to crafts and creative activities and over 2,000 square feet to our play area. 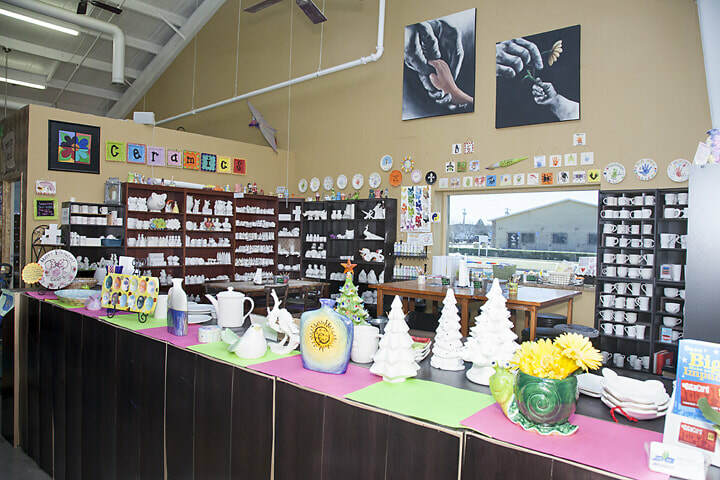 We give our customers all-day access to painting, play-dough sculpting, magnet wall and more. For an additional cost, Unpluggits also offers a variety of crafts which can be painted and taken home the same day. Children can choose from an assortment of ceramics, including banks in the shape of robots, frogs, cupcakes and more, or they can take advantage of Unpluggits’ collection of wooden items, toys, picture frames, or wiggly toys. Once the little artiste is satisfied, they can get down to the business of playing on the two-story play indoor playground. This area includes a giant pirate ship, slides, tunnels, air hockey, foosball, an area to play dress-up, and a toddler area with only 2 and under allowed. You can monitor your child’s fun from either their side or from a work counter that faces the playground. Children under the age of 13 must be accompanied by a guardian. For the the busy mom and dad, Unpluggits offers free wifi. wI was a full-time working mom who wanted a place to “chill out” with my kids. We frequented the local parks, art festivals, children's museums and I wished I could enjoy this type of experience more often. We also frequented amusement parks, movies and arcades. But sometimes I felt these were our only options. One day I had a brilliant idea that me and my 3-year old son would paint a coffee mug together at a ceramic studio. It would be this incredible bonding experience for us. Three to four swipes of paint and my little artist was done. While I tried my best to hurry out of there, he proceeded to run circles around and crawling under the table while I endured glares from the shop employees and other adult customers. I doubt anyone would ever classify me as a tiger mom. But I felt guilty about how much my kids (and I) watched TV and played video games. It's important for kids to have time for some unstructured activities and play time to figure out who they are and how to get along with others. I tell people this business was my mid-life crisis. Instead of buying that brand new Sky Blue Thunderbird convertible and heading to the California coast to learn how to make wine, I started Unpluggits Playstudio, renamed Paint & Play. I wanted an inviting place to create with the whole family in mind. I designed it with windows into the playground and low shelving so parents could easily spot their kids while in the studio. This way if mom wants to paint a coffee cup while her rowy son plays, she can!